View More In Pedals & Cleats. 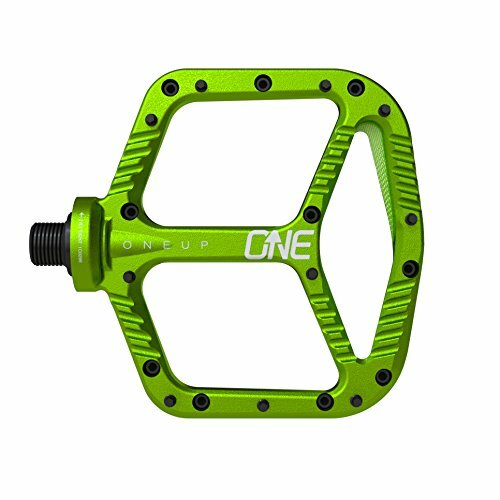 The OneUp Aluminum Pedal features a huge (115x105mm) super grippy platform with 10 rear-loading hexagonal steel pins per side to keep your feet planted on even the roughest of trails. With a weight of only 355g, the OneUp Aluminum Pedals won't slow you down on the climbs. Designed from stealth rubber down and shaped with a subtle convex profile to provide you with more grip thanks to the pedal sitting in the natural arch of your foot. The ultra-thin design (only 8mm at the leading edge) gives you maximum clearance to reduce pedal strikes and deflect off trail obstacle. Clip Less, Ride More. Each pedal contains 4 double sealed full cartridge bearing and no bushings, to eliminate axle play and provide ultimate long-term durability. When it s finally time to service your bearings, the unique cassette tool lock ring system makes re-greasing the bearings exceptionally fast and easy. Available in 3 colors, Black, Green and Grey. VITAL-MTB 4.5/5 Star Review "With a thin and wide design that provides plenty of grip and stability, the OneUp aluminum pedal offers great performance in a durable and easy to maintain package" "The wide and thin body offers great support and lots of room for those who like to move their feet around. The long, sharp pins are placed mainly around the edges which gives an overall concave feel to the pedal, with impressive grip no matter where you put your foot down." Head over to the website Vital-MTB to read the full review. 4.5 / 5 Star Review by Vital-MTB a leading mountain bike website. If you have any questions about this product by OneUp Components, contact us by completing and submitting the form below. If you are looking for a specif part number, please include it with your message.